This project has been a lot of fun for me. It’s also been time-consuming. Not gonna lie. But I’ll tell you that every second I’ve spent working on making the spaces in my home more organized, the better I feel every day. Today, we’re going to take a look at the Home Binder. I just got mine and set it up, otherwise I would have posted a little sooner for you. I decided to give the Duo Binder a try. I think it might be a winner, but I haven’t had a chance to use it yet. Check out it out. I love the color. (Pink is my favorite.) I did notice that the tags of my slip covers stick out a little. It hasn’t caused a problem, but some of you may want to simply do plain slip covers with no labels. Regardless of the labels, I also have a cover sheet for each section, so there are other ways to separate the sections if you don’t like the tags extending out a little. There are also other versions similar to this online. I made sure to buy online because it was so much cheaper than going to an office supply store. I love the Duo Binder because it has a 3-ring binder AND and accordion file. Awesome! If I want to keep receipts or Cam’s important school papers, I can put them all in the binder and know where they are without having to worry about finding something later that needs to be signed or turned in ASAP. (The only con is that it’s not a D-ring binder, which I’ve always preferred.) 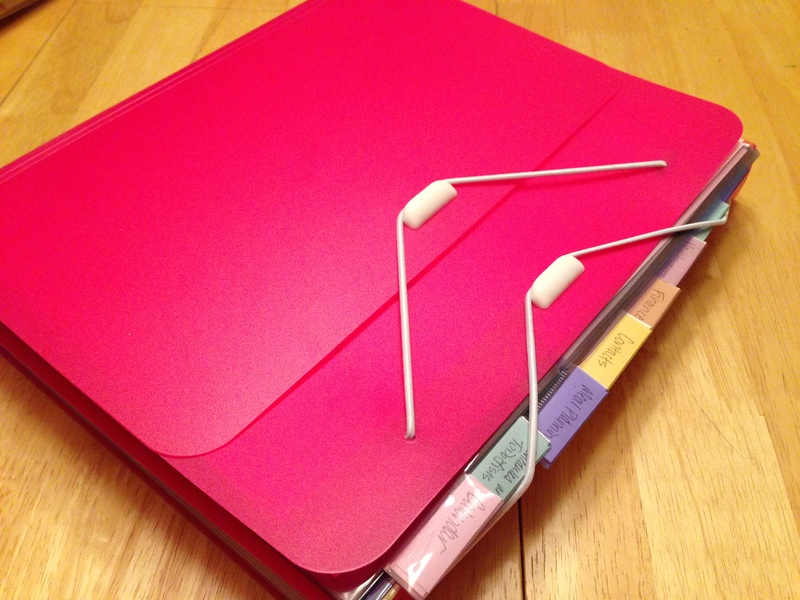 You can set up your binder in any way, but there are some really good ideas on Pinterest for binder organization. Many of them have really cute pages you can print off for your binder. Or you can just make your own if you want a creative flair. I used Ginny’s at Organizing Home Life for most of my sheets, but I also included a couple from Jen at I Heart Organizing. Ginny offers her sheets for free if you have the patience to print each one off individually or you can just buy the entire package outright on her page. Eventually, I’ll make my own sheets, but I’m using theirs for now until I have the time to sit down and make some. I will say that Jen’s stuff is very colorful and adorable. Calendar – The first page on this one includes a sheet with birthdays and anniversaries. Then it goes to a basic calendar where we will put events such as football, baseball, family visits, etc. Schedules and To-Do Lists – This section has a chore list for Camdon, a weekly and monthly cleaning checklist, and Cam’s school class schedule. Meal Planning – This section has proven to be more helpful than I would have ever thought. It was the first section I created and started using. I have meals and a grocery list in this section. It was also very useful in helping me clean out my pantry. Planning out meals ensures that I actually use what I have in my pantry, fridge, and freezer. It also keeps me from going to grocery store and either forgetting something or just randomly buying items that will just sit in my pantry. Contacts – This section is really more for Camdon since he’s old enough now to be home alone. We have sheets with contract information for our relative, friends, and neighbors. There is also contact information for school, utilities, and medical information. Finances – We haven’t used the finance section yet, but ultimately, it’s just a budget sheet with bills and when they are due. You can certainly go into more detail for your budget, but we just didn’t want too much money information just floating around the house. Maintenance – The maintenance section will be of great use since I’m not very good at maintaining my vehicle, so I’m very excited to get this section started. Here, I can keep track of maintaining my house, my car, and my home projects. I have an auto log for Mike’s car and my Jeep. Electronics – This was a section I added myself, and I haven’t seen anyone offer it. I haven’t filled it out yet since I’ve only had my binder for 36 hours, but here is where I will keep all of the serial numbers to our electronics. In case of theft, at least we might be able to keep someone from selling them again or even help the police find our missing items. My sister and I learned this the hard way. Oh, thieves and their rude ways. Let me know how your CAN and your binder help you with your organization. If you have any ideas about what to put into your Home Binder, please post it in the comments. This week we will start working on organizing your rooms, cabinets, closets, and drawers. I might show you before and after pictures of my home. I just want to warn you that we are a very messy (not dirty) family, but I haven’t decided if I’m going to share the before pics. We’ll see…. I’ll be talking about Julie Morgenstern’s book Organizing From the Inside Out and Regina Leeds’ book One Year to an Organized Life. I can’t wait to get started with organizing. We might be an extremely disorganized family, but it doesn’t mean that we enjoy living in the chaos!